While Congress lectures Facebook CEO Mark Zuckerberg on the importance of respecting user privacy, they ignore the fact that they are responsible for allowing illegal spying on millions of American citizens. Members of the same government that is responsible for violating privacy laws and illegally collecting data from its citizens, openly lectured the CEO of a company for violating privacy laws and illegally collecting data from its users—a case of irony that could only play out in a country that brags about the unprecedented freedom enjoyed by its citizens. The special congressional hearing on Facebook’s use of user data lasted for five hours on Tuesday, and the word “privacy” was mentioned nearly 100 times. 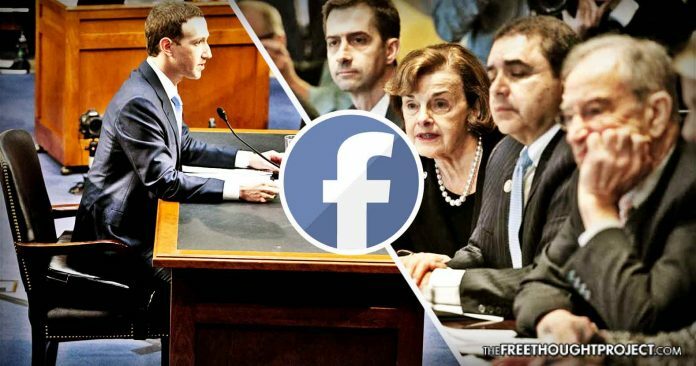 While there were a number of questions as to whether Senators Diane Feinstein and Chuck Grassley—who are both 84 years old—fully grasped the concept of Facebook and its business model, the concerns about how the social media giant is treating its users was overwhelming. Sen. Bill Nelson, 75, insisted that if Facebook does not ensure privacy for its users, then Americans’ personal privacy will be jeopardized, requiring the government to interfere. However, there was one significant fallacy that is either not understood or is simply being ignored by the members of Congress who addressed Zuckerberg. When individuals create Facebook accounts they know that the photos they share are not their own anymore, they know that every time they react to a status or share their thoughts on a product or service, it will be used to create targeted advertisements that will appear in their newsfeeds. Americans have the ability to decide whether they give Facebook access to their data, or whether they have a Facebook account at all. But they do not have the ability to decide whether their data is stolen and used by the U.S. government. While Facebook makes it clear that it is using your reactions to content to create targeted ads for your newsfeed and that it is using the photos you post of yourself to create a facial recognition profile that automatically tags your face in other photos, the government has attempted to be discreet about its data collection. The National Security Agency initially claimed that it was only collecting data from foreign targets that it believed were suspected “terrorists.” That excuse lasted up until former NSA contractor Edward Snowden released a trove of classified documents in 2013 that showed the government was collecting data from and spying on innocent Americans. Even after a court ruled that the NSA’s data collection and domestic spying practices were illegal in 2015, no one has been held accountable for violating the privacy of countless Americans, and the practices have only continued. When Congress announced its first attempt to reauthorize Section 702 of the Foreign Intelligence Surveillance Act (FISA) in late 2017, it received massive scrutiny from privacy advocates who warned that the bill would provide additional loopholes for the government to continue conducting warrantless surveillance of innocent Americans, and it would ultimately be worse for civil liberties than the previous legislation. However, reports noted that the government is actually following a pattern of legalizing practices that they have already been carrying out, which has been ongoing for years. With the first new law in place, the FBI no longer has to apply for a warrant “when national security is involved, or when it determines that there is a ‘threat to life or serious bodily harm,” according to a report from the Intercept. The agency will also continue to have unlimited access to data collected by the NSA, even when it does not pertain to a criminal investigation. While users are aware of the fact that Facebook has access to their data, it is also true that the social media platform has followed in the footsteps of the U.S. government by giving itself unlimited power, and then abusing that power for financial gain. At the end of the day, neither Facebook officials nor U.S. government officials have any business criticizing each other when it comes to willingly abusing the privacy of Americans’ data.